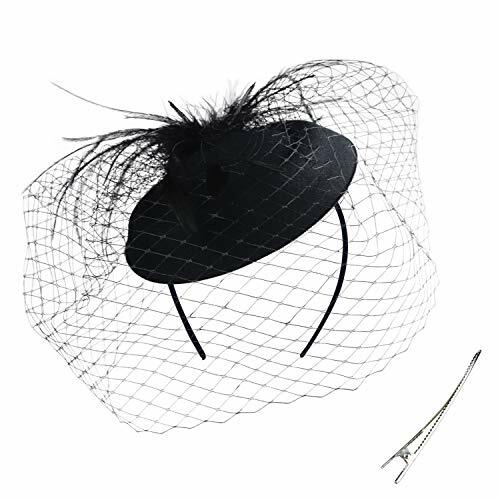 A dramatic plume of netting lends vintage glamour while an alligator clip keeps this embellishment secure. The black netting being long enough to partially cover or fully cover your face. Firmly secured underneath with headband and clip to hold in place and to give you the versatility to wear it any desire you like. 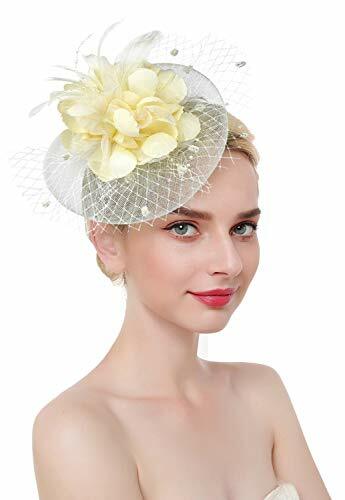 You can style your hair like a bun and use it as a bridal flower hair clip or you can place it further towards your face and wear it as vintage-styled flower fascinator. 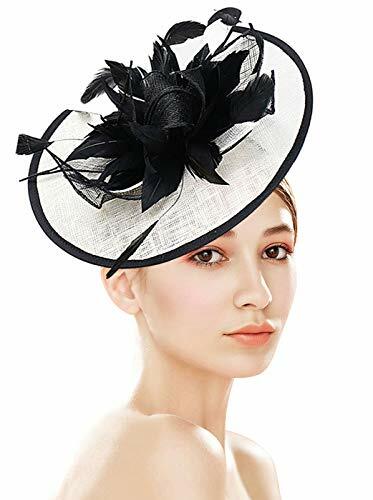 Package: 1 Fascinator Hat. Size: 6.5" diameter 1.5" high derby hat. Is poise your passion? 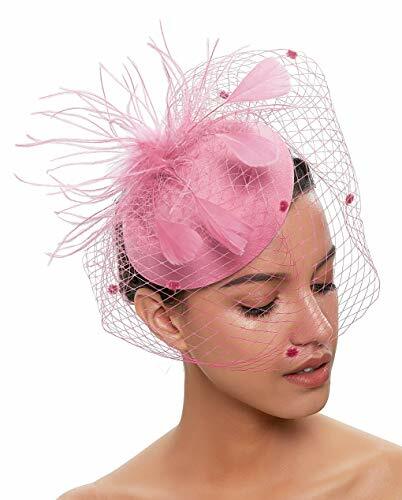 An elegant pillbox hat from DRESHOW, this mid-century inspired accessory is crafted in soft material base, elegantly outfitted with flocked netting and a beautiful embellishment on top. 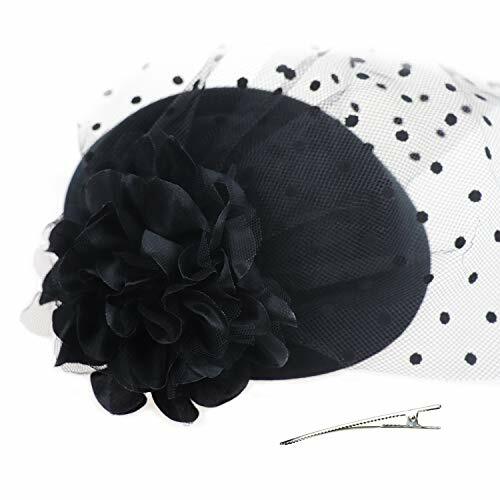 Outfitted with an elegant bow and pearl. 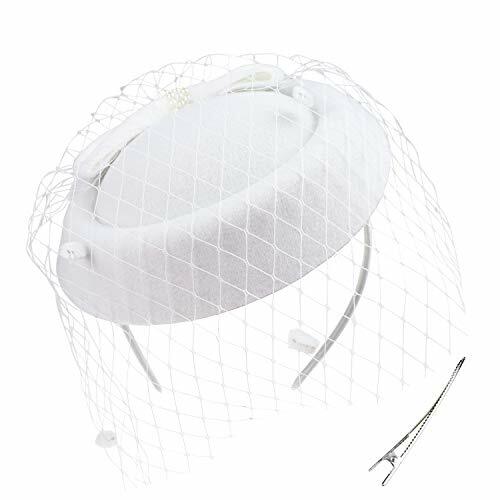 This divine accessory features a beautiful bow wrought in pearl on flexible but sturdy mesh support. 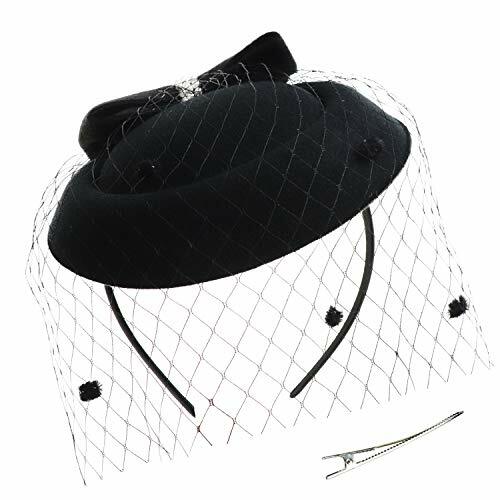 The black netting being long enough to partially cover or fully cover your face. 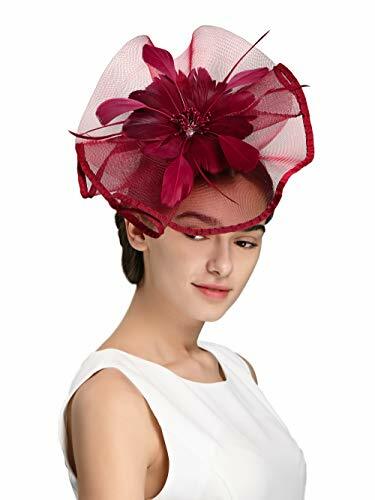 Package: 1 Fascinator Hat. Size: 6.4" x 5.3", diameter derby hat. 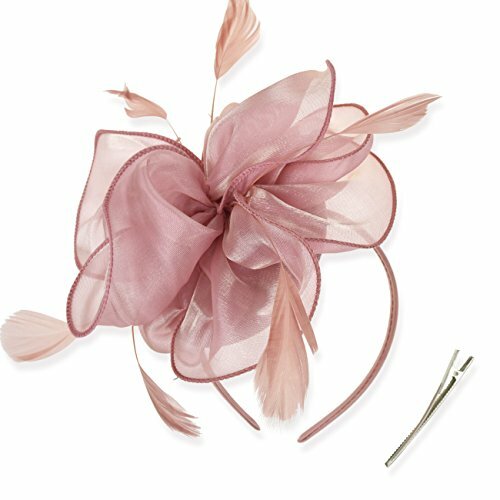 Material: This vintage fancy and glamour charming hat with an organza ribbon and flighty feathers that sway in the wind. Trendy style matches everything. One size fits all. 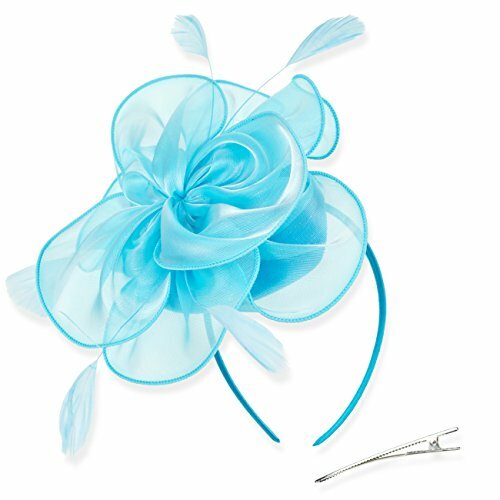 You can style your hair like a bun and use it as a bridal flower hair clip or you can place it further towards your face and wear it as a vintage styled flower fascinator. Firmly secured underneath with headband and clip to hold in place and to give you the versatility to wear it any desire you like. 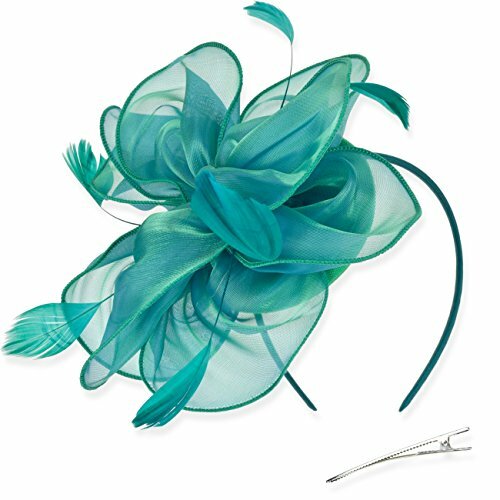 This sassy fascinator gives a nod to vintage style with a bouncy mesh base organza ribbon and flight feathers. 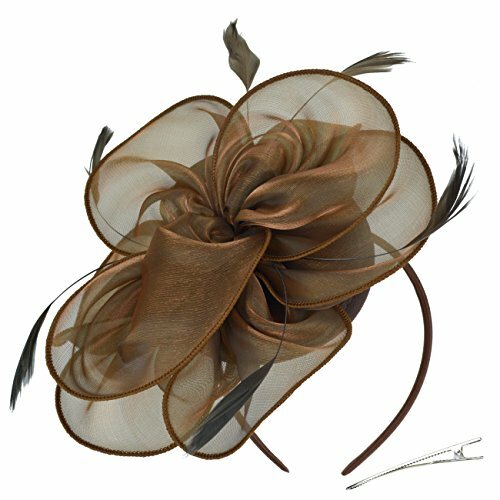 This timeless, classy and elegant vintage inspired feather fascinator hat is suitable for as a wedding Fascinator, tea party hat, Cocktail hat, black merry hat or any special occasion. Package: 1 Grey Fasicnator Hat. Size: 8.2 inch diameter Flower. Package: 1 Black Fasicnator Hat. Size: 8.2 inch diameter Flower. Package: 1 Light Blue Fasicnator Hat. Size: 8.2 inch diameter Flower. Package: 1 Gold Fasicnator Hat. Size: 8.2 inch diameter Flower. Timeless glamour. 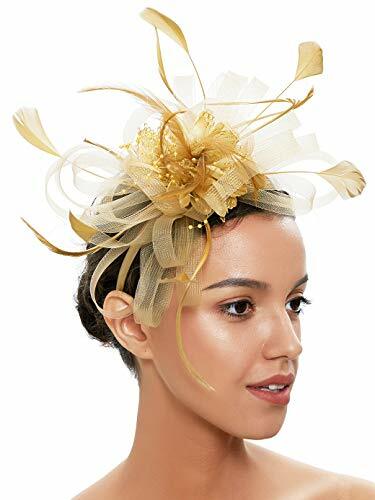 This sassy fascinator gives a nod to vintage style with a bouncy mesh ribbon and flighty feathers. 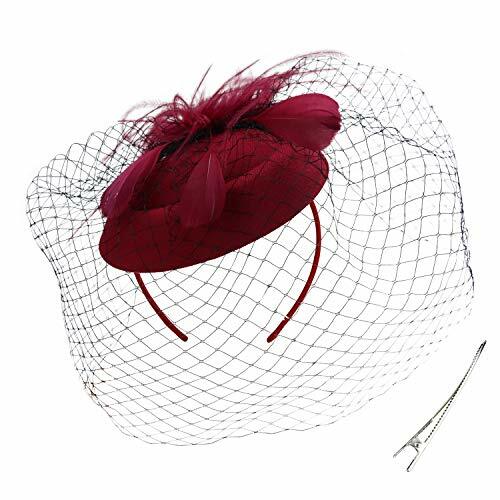 With its classic sinamay mesh shape and elegant look it will be your go-to fascinator for the season. Package: 1 Beige Fasicnator Hat. Size: 7 inch diameter Flower. Package: 1 Brown Fasicnator Hat. Size: 8.2 inch diameter Flower. Package: 1 Blue Fasicnator Hat. Size: 7 inch diameter Flower. Package: 1 Pink Fasicnator Hat. Size: 8.2 inch diameter Flower. Package: 1 Navy Fasicnator Hat. Size: 7 inch diameter Flower. Package: 1 Red Fasicnator Hat. Size: 7 inch diameter Flower. 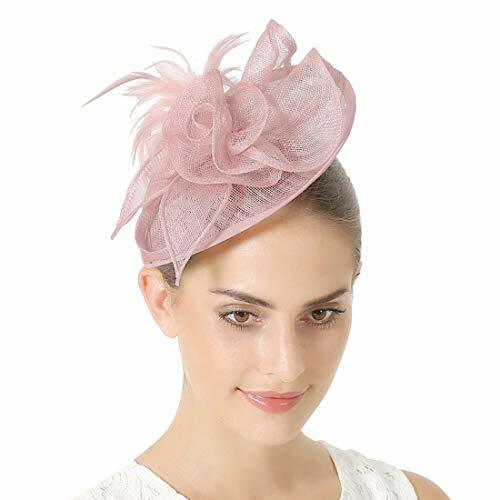 Material: The 100% handmade fascinator hat is made of Mesh and Feather, 1 Headband and 1 Crocodile Clip. 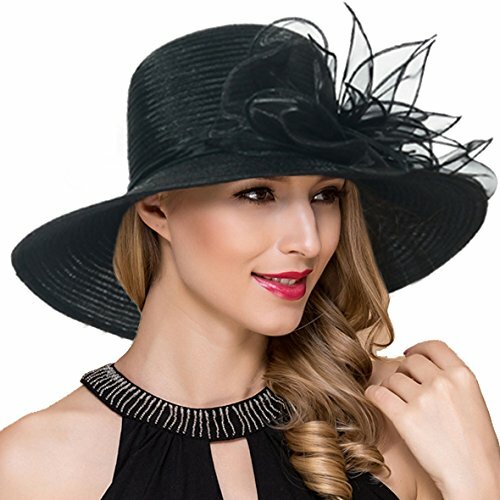 Lightweight Cocktail Fascinator Hat with Veil and Feathers Which Clips to Secure to The Hair easily.It Can Be for Any Season and Events. 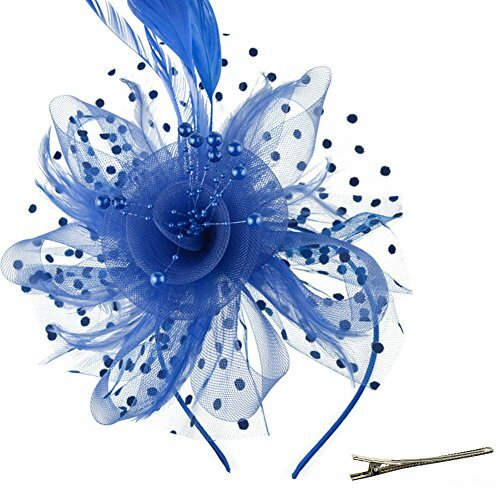 Classic design exterior with flower feather decoration hair clip for derby. 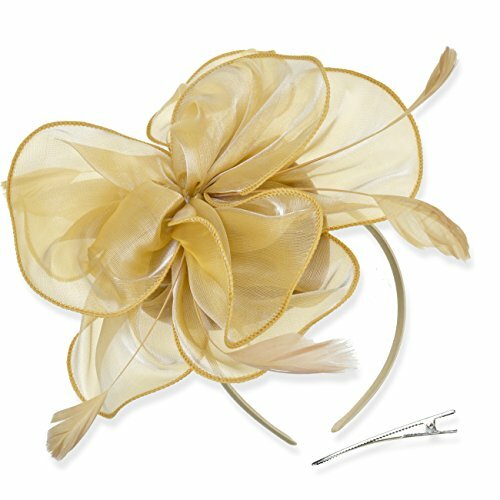 Bridal fascinator clip for unique wedding and party accessories. 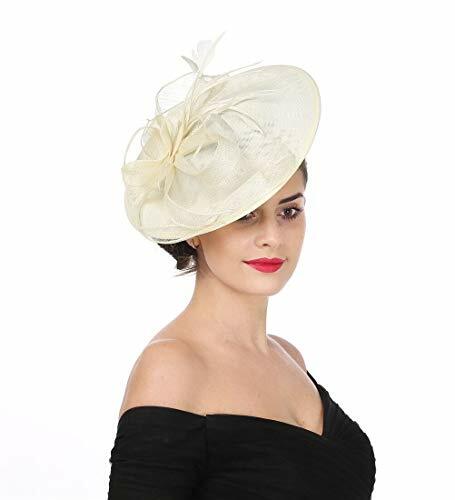 ❤ Retro Style Design: 1920s classic bowler hat, asymmetric roll-brim designed. Decorating with beautiful feathers and cocktails, extremely lightweight. 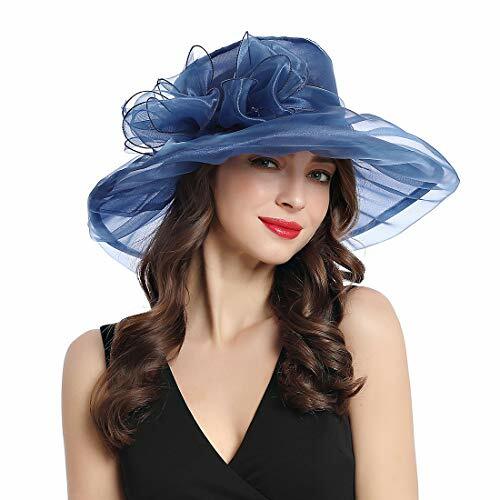 It's a perfect fancy hat deal with your gorgeous dress for Kentucky Derby race party. 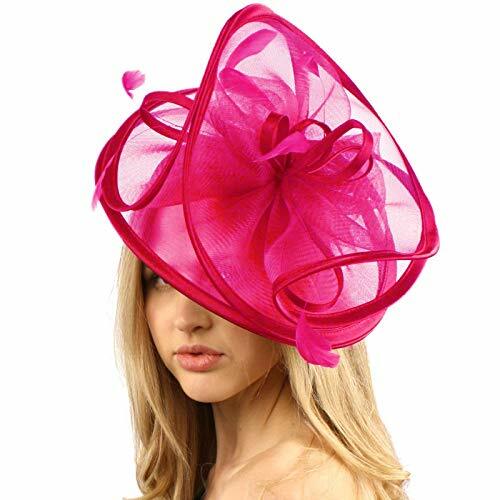 Derby Horse race is really more of a fashion show for the most over-the-top hats of a year. 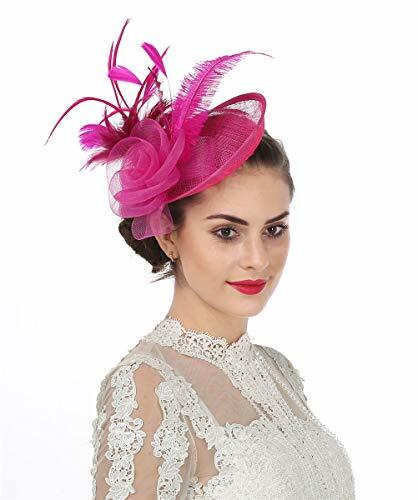 So choose this fascinators hat come with the big bow and stunning feathers is a great way to add the extra flair. And you will be the center of attention. 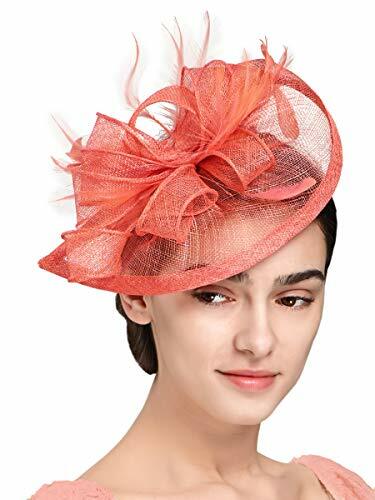 ❤ Colorful Hats: Fascinators can be worn to many other occasion besides the Kentucky Derby race. 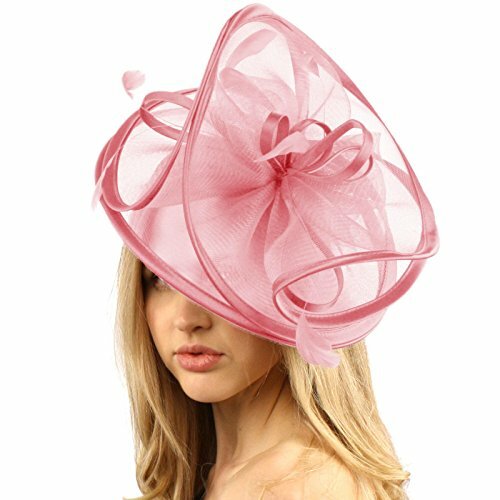 The British Royals made fascinators for women a standard for all festive events such as weddings, Easter, prom and a tea party. 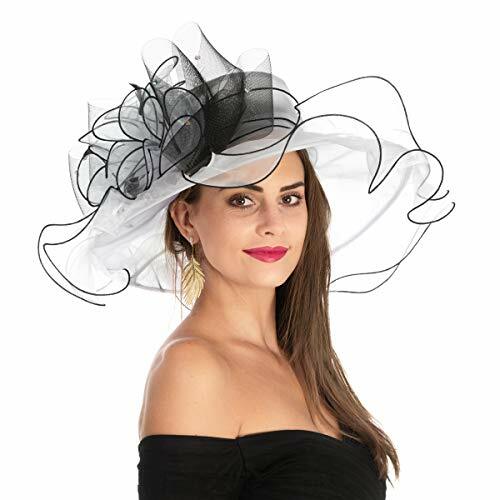 Choose a black hat with a veil is perfect for the a church event. 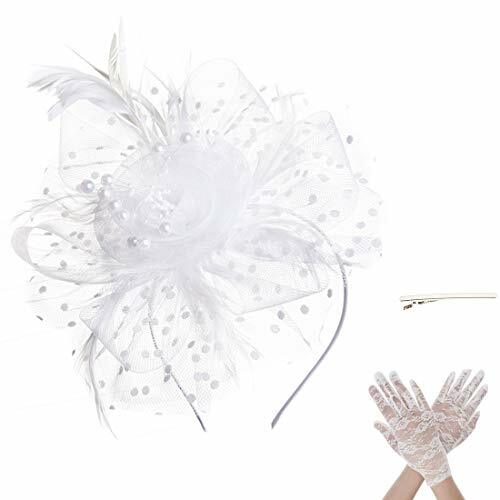 Pick the fascinator hat in white to match your dress for the wedding. Select a red one to participate your tea party. ❤ Material: 100% Korean organza (Polyester). It featured a silky smooth and soft touching. satin silk like quality but far more durable and easy care. ❤ Size: Medium ( US 7 1/4 ) 58cm. Come with a string inside of the cap for adjusting the sizing. The one size can fits most female who head circumference between 21.5 inches~23.5 inches. The crown tall is 4 inches around. 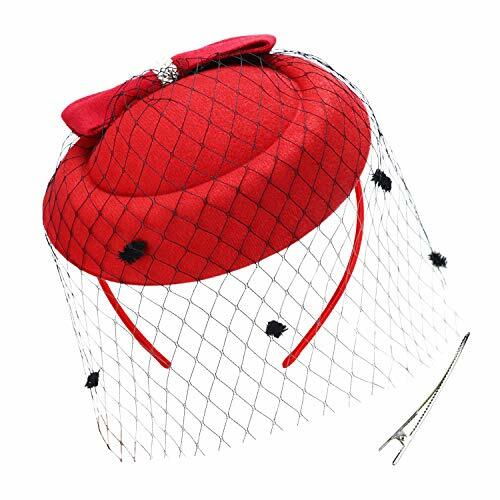 ❤ Care Tips: To reshape this stain sun hat that has been wrinkled or bent, The simple tool you needed is "steam iron". Steam the area for five seconds and then shape with fingers as soon as it is cool enough to touch, usually 2-3 seconds. Let the organza hat dry for 1 hour in shield place. 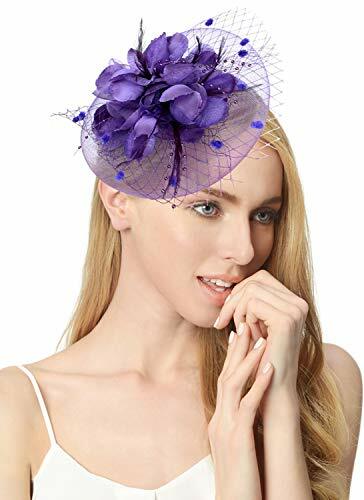 Your lady hat will be as good as new. 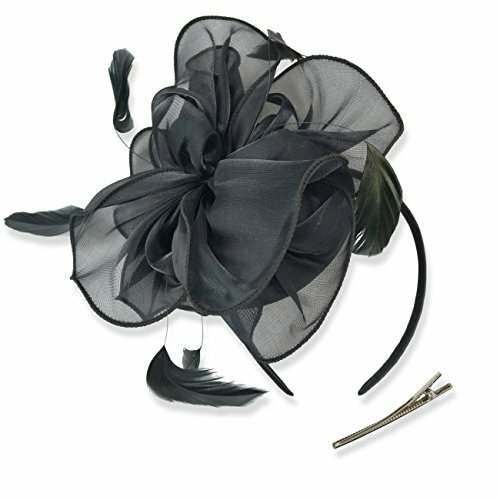 Fascinators Material: Net,Feather,Sinamay .Accessories with clip. 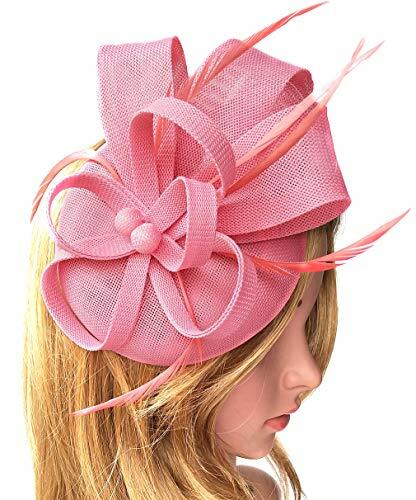 Comfortable and light to wear Fascinators : easy to wear with its clip.Colors available:blush pink,Champagne,hot pink,black,navy,silver grey,red,ivory. 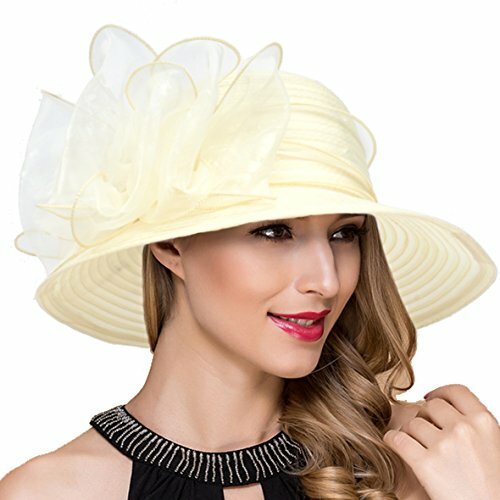 Perfect for Kentucky Derby hat,Tea Party,costume party, bridal shower party, wedding, church, cocktail party photography.Great value for ladies,friends or woman on her party or event and special occasion. 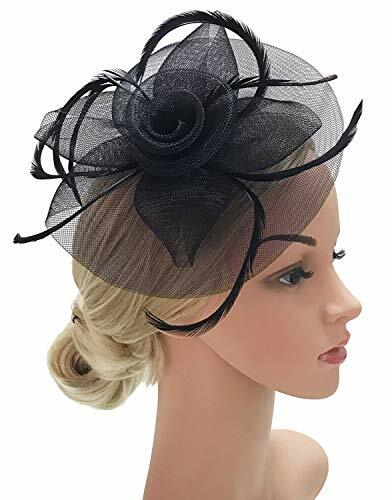 The fascinators is reversible and removable on the headband, you can free combination of them, and it is easy to wear with a comfortable headband or the hair clip to secure to the hair. 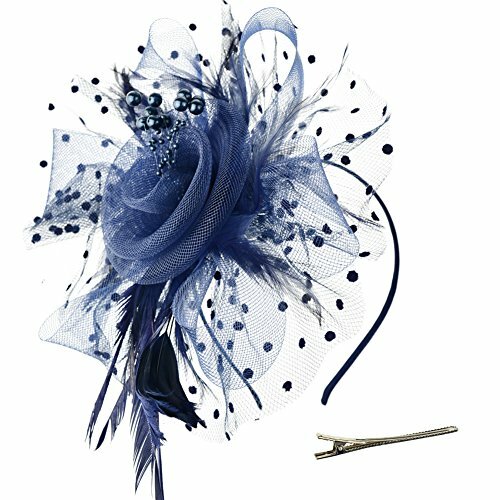 Classic british design exterior with flower feather decoration hair clip for derby. 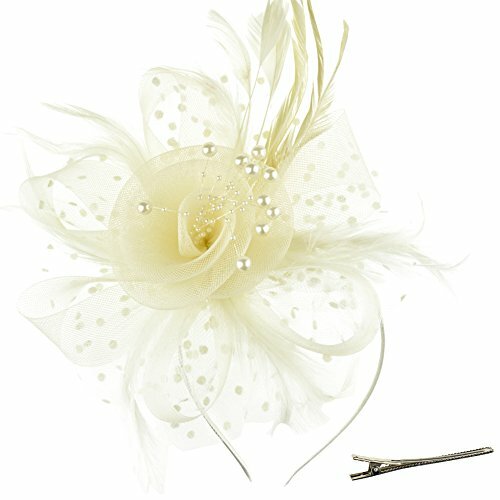 Bridal fascinator clip for unique wedding and party accessories. 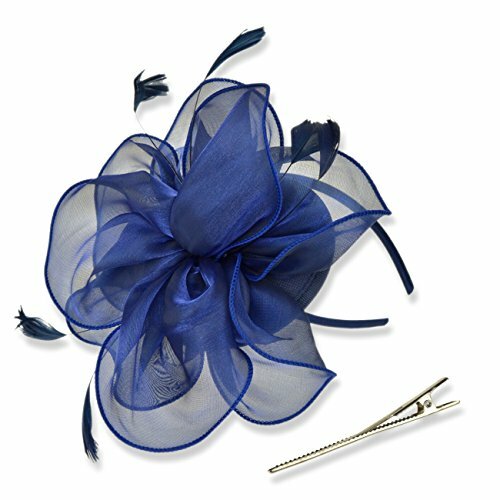 Excellent Material: High quality organza,100% Polyester and Satin. Super lightweight material will not make you feel heavy. Sweatband drawstring adjuster inside, can adjustable to size-fit to your head. 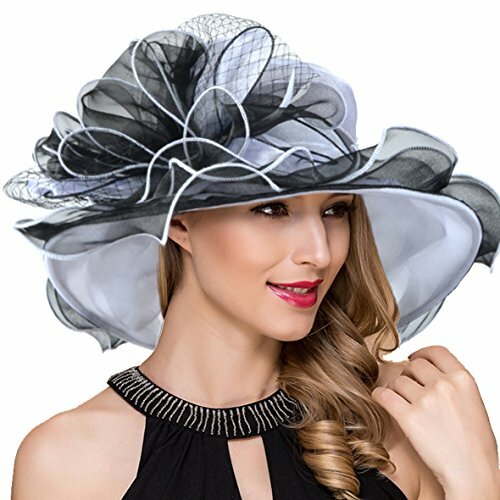 Perfect for wear a fancy event: Wear to Church/Kentucky Derby/Wedding/race day events/Tea party/Twenty's Parties or Gatsby Picnics. Great for ladies, and teens and girls. 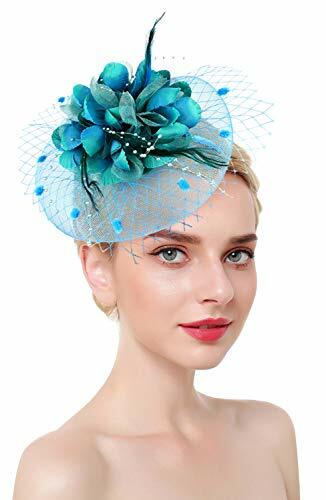 Cleaning and maintenance: For the first time using, Warmly suggest you use hair dryer to trim or steam ironing it ,make sure that the shapes of hat looks more high-end and elegant. Dry clean recommend or clean it by wet cloth wiped. Do not wash frequently. Please put it in dry and clean place if you don't wear. 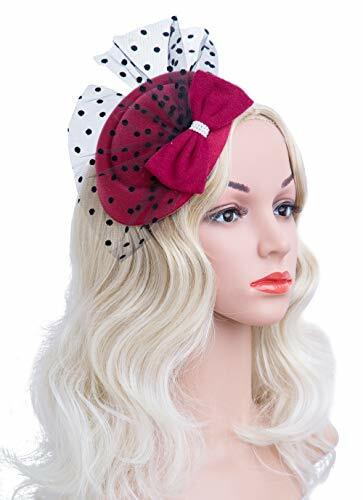 The fascinators is reversible and removable on the headband, you can free combination of them, and it is easy to wear with a comfortable headband or the hair clip to secure to the hair. 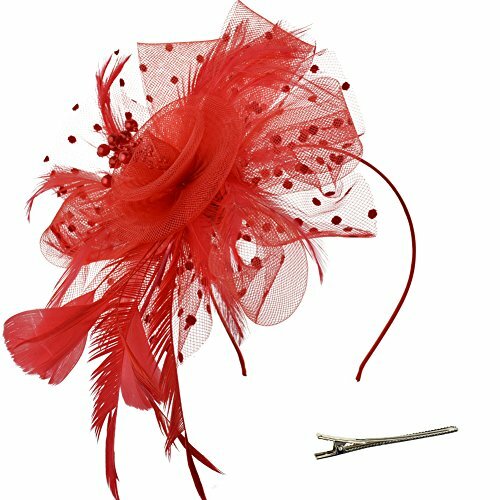 Classic design exterior with flower feather decoration hair clip for derby. 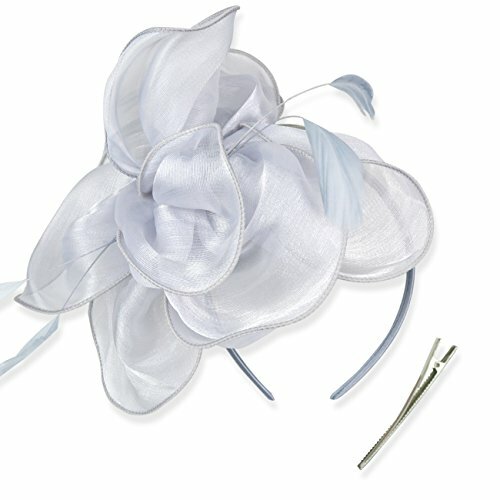 Bridal fascinator clip for unique wedding and party accessories. 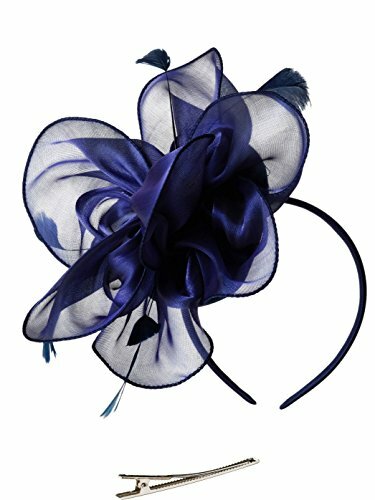 Beautiful lightweight handmade cocktail Fascinator Hat with flower Veil and feathers which clips to secure it to the hair easily. 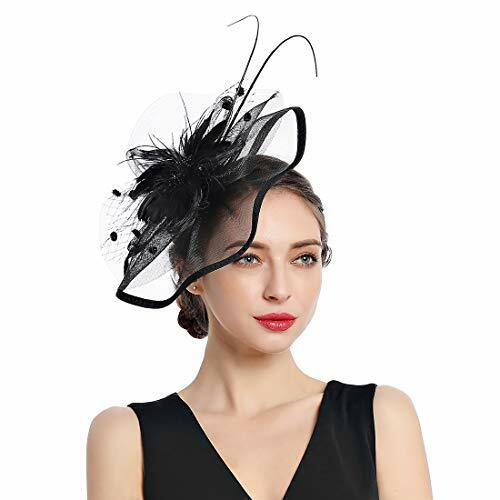 This sassy fascinator hat gives a nod to vintage style with a bouncy mesh net and Hard solidfeathers. 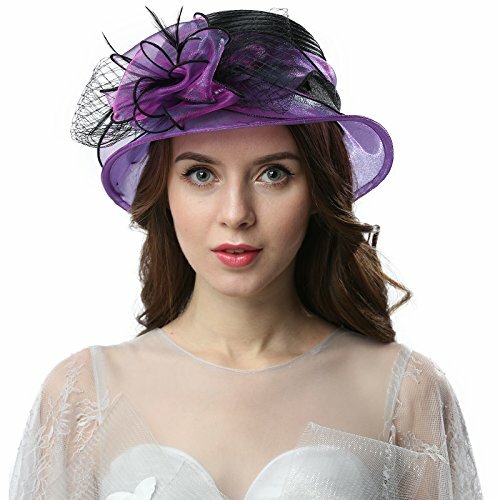 Suitable for photography, costume party, bridal party, wedding, church, cocktail party and tea party ,Wear it to parties, weddings, Christma，for your mom on Mother's Day. 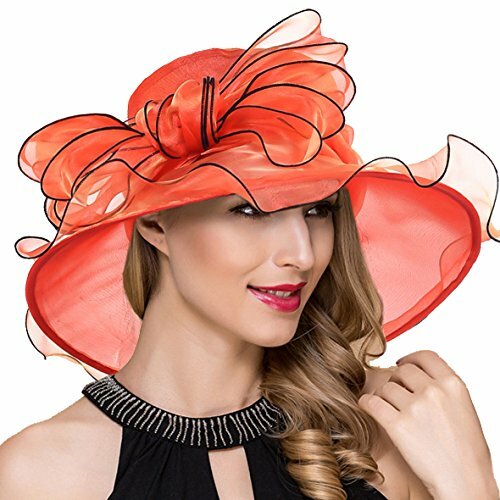 Elegant Women sun hat for Church / Kentucky Derby/Ascot Race/Cocktail Party / Wedding /race day events/ Tea party / Outing travel /shopping/formal occassion/outdoor. 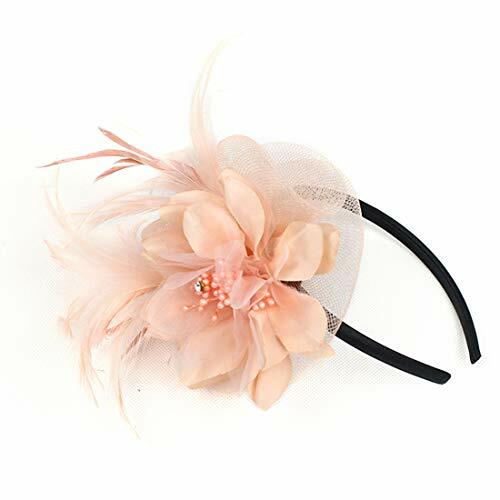 It's Round Base and Slip-on Headband will Allow you to Look Flawless and Enjoy any Event with Ease! 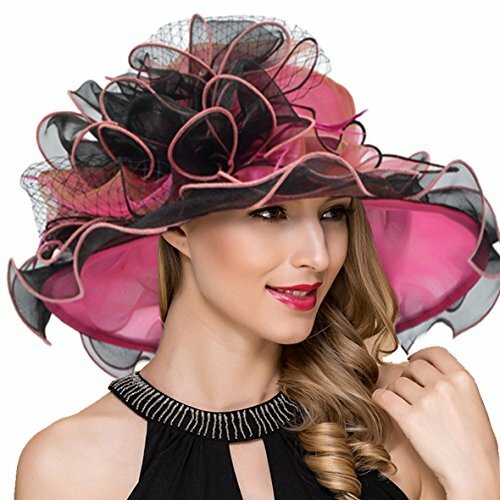 It is Lightweight Comfortable also Easy to Wear.Wear this fancy hat to the Kentucky Derby race and dazzle everybody's eyes. 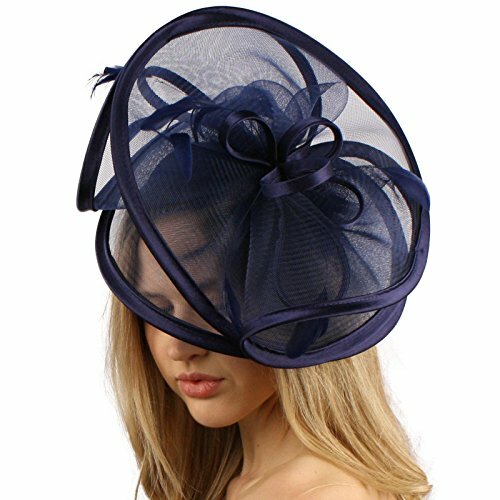 Beautiful Lightweight Handmade cocktail Fascinator Hat with Veil and Feathers Which Clips to Secure it to The Hair easily.It Can Be for Any Season. 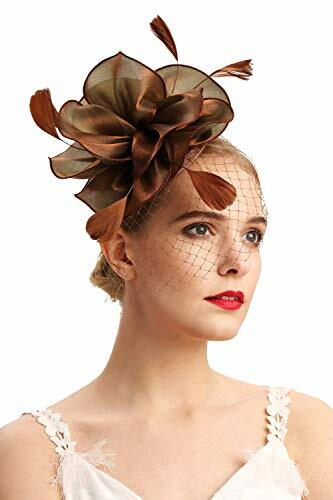 This Beautiful, Timeless, Classy and Elegant Vintage Inspired Feather Fascinator Hat is Suitable for as a Wedding Fascinator,Themed Tea Party Hat, Garden Party, Easter,Church, Cocktail Hat, Fashion Show,Carnivals, Performance or any Events any Special Occasion. we have more than 20 differents design can choose. 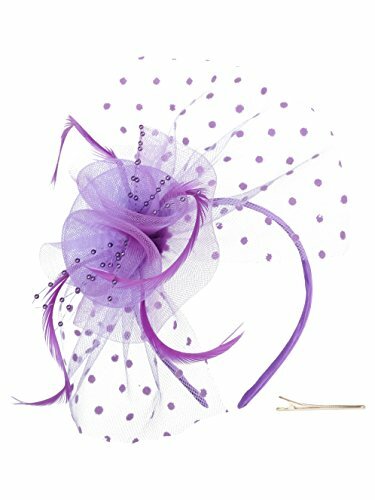 Material:Net and Feather Attacment:clip and headband The color may vary slightly from the online image due to monitor color settings.